When traveling to Hawaii, many visitors spend ample time taking in the scenic views over the pristine waters of the Pacific Ocean. But what if you could see those gorgeous views from above? Parasailing in Hawaii offers you the chance to see the islands and water from a completely different vantage point, while giving you the exhilaration of being up to 300 feet in the air. To get in on this fun activity, you should make a reservation in advance. Simply call or sign up online to reserve your spot on the boat. Most tours take anywhere from four to eight people at a time, so you will want to sign up early to make sure you don't miss out, especially if you are part of a group. At the appointed time, you should arrive at the dock. Have sunscreen and a towel handy, as well as a waterproof camera if you wish to take pictures. While traveling on the boat to the designated parasailing zone, you will get a safety briefing. This may be in the form of a video, or verbal instruction from the crew. Listen carefully, as all of this information is important to have a safe, fun experience. Upon arrival in the parasailing zone, you will be strapped into the harness. Then the wind fills up the parachute, and you are off into the air. Most rides last anywhere from 6 to 10 minutes, depending on the length of the tour and how many people are on board. While in the air, you can take pictures to show family and friends back home. Many tour operators also take pictures, which are then made available for sale after the boat returns to the dock. You have a few choices to make for your parasailing adventure. You can either go up solo, or use what is called a tandem harness. 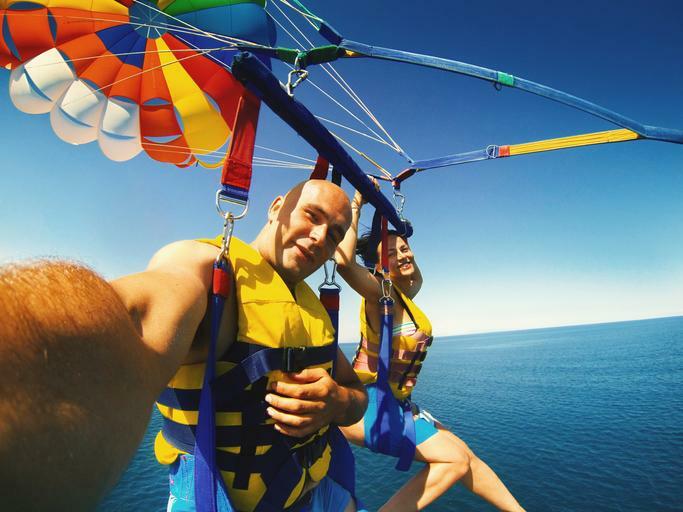 The tandem harness is used when two people want to parasail together. Couples or parents with children often like to have the tandem experience. The other big decision you have to make is whether you want a wet or a dry landing. With a wet landing, the captain of the boat brings you back down slowly, then lets you linger over the water for a bit before dunking you in. If you choose this route, make sure you wear a bathing suit, or at the very least clothes you don't mind getting wet. If you don't wish to get wet, you can opt for a dry landing. This means the captain and crew will pull you down slowly, ensuring you land directly on the boat. There is no dunking in the water, so you are perfectly dry when you get back to shore. 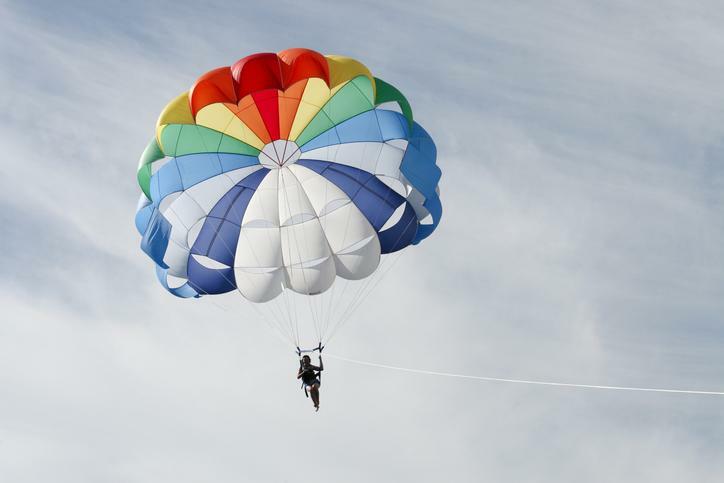 Many people try parasailing for the first time and get hooked. If this is the case and you wish for more air time, you can ask your tour operator if there are package deals. Some companies offer discounts when you book multiple sailings in advance. Whether you go once or a dozen times, parasailing is an experience everyone should have at least once in their lifetime.